Comes packaged in a barn-shaped box! Each barn comes with one horse figure! Figures stand over 5 cm tall! Now you can collect your own herd of wild horses with the DreamWorks Spirit Riding Free Mini Horse Figures. These realistic horses are inspired by the new Netflix series, DreamWorks Spirit Riding Free. Each figure stands over 2 inches tall and comes packaged in a miniature barn and includes a stable! 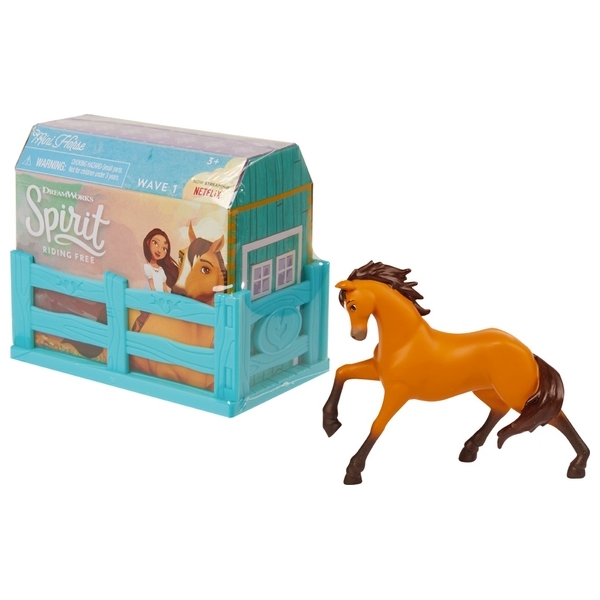 Open the barn to reveal the latest addition to your growing horse collection! The surprise is half the fun! Collect all 8 unique horse figures to create your own corral! Perfect for both kids and collectors alike. Each figure sold separately. EU Warning: Not suitable for children under the age of 3 years due to small parts which could cause a choking hazard. Have an adult remove and dispose of all packaging, ties and fasteners before use.